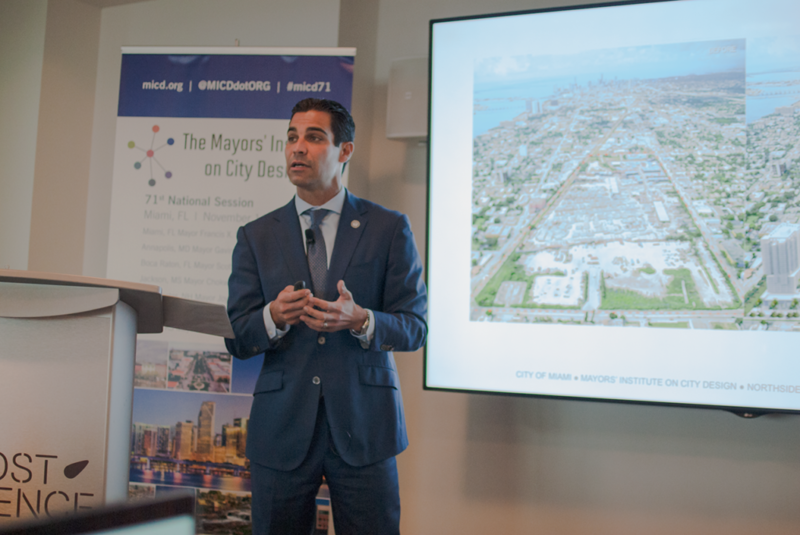 NOVEMBER 2018 – MIAMI – Miami, FL Mayor Francis Suarez hosted the 71st National Session of the Mayors’ Institute on City Design (MICD) from November 14-16, 2018. Eight experts in architecture, landscape architecture, urban planning, economic development, transportation, real estate development, and urban design joined a group of seven mayors in two and a half days of discussions, offering pragmatic advice on how the mayors could approach the design and development challenges facing each of their cities. At the forefront of the discussions were concerns about equity, with each mayor describing a “tale of two cities” in which recent successful development is leaving some residents behind. As a result, mayors are increasingly shifting their attention to neighborhoods outside of downtown, while simultaneously seeking ways to prevent displacing residents and losing the neighborhoods’ unique culture and character. While learning more about the long-term planning required for successful development, mayors also sought “quick wins” to demonstrate the city’s commitment and get residents excited about the future. Members of the Resource Team, experts who served in a volunteer role on behalf of the nation’s cities, drove home the most important lessons of their careers. The importance of meaningful community engagement and a robust design process came up again and again, with many examples of success through grassroots engagement and careful planning. Resource Team members stressed that mayoral leadership is a crucial ingredient in making projects equitable, sustainable, and loved by the community; regardless of the mayor’s power on paper, city staff and residents look to the mayor to set the tone, vision, and goals for every project. The 71st National Session began with a tour of Miami that showcased how public investments catalyzed private development in the Design District and Wynwood. The tour ended at Wynwood Walls for the opening reception, where Mayor Suarez, U.S. Conference of Mayors CEO & Executive Director Tom Cochran, National Endowment for the Arts Design and Creative Placemaking Director Jennifer Hughes, and MICD Executive Director Trinity Simons welcomed participants. After two full days of discussions, Mayor Suarez also concluded the Institute with a robust discussion of upcoming development projects in Miami. Topeka, KS Mayor Michelle De La Isla.